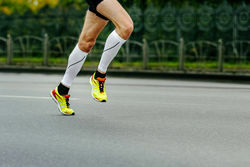 Should I wear compression socks if I have a running injury? Today on the Doc On The Run podcast were talking about whether or not you should wear compression socks when you have a running injury. Whether you have a metatarsal stress fracture from running a little too much, or you rolled your ankle while running on a trail and got an avulsion fracture of the fifth metatarsal bone, your foot can swell up like a balloon. A hot air balloon may be a beautiful form of transportation but it certainly not the most efficient. And although the inflammatory process that produces swelling is supposed to help you heal, you won’t heal as quickly if your foot is swollen and blown up like a balloon. You have to deflate that balloon and remove the swelling before you can make progress. The inflammatory phase is the first phase of wound healing. That’s where you get pain swelling redness and all of the initial outward signs of injury. That initial phase is supposed to deliver all of the cells to the area of injury to remove debris and start the healing process. But, as a runner, the part you are most interested in is the proliferative phase. During the proliferative phase of wound healing you get new collagen forming which helps bind structures together and stabilize them. You can’t move broken pieces and expect them to heal. You have to have stability before you can start motion. Obviously it follows that if you want to heal and start running as quickly as possible, you have to get that injured tissue stable enough so it can handle early range of motion and then progress to more aggressive, more stressful activities like running. Applying compression to help push out the inflammation makes a lot of sense. Emergency room physicians and athletic trainers have been applying elastic ace wraps to sprained feet and ankles for decades. The problem with elastic compressive bandages like this is that it is very technician depending. If you apply them with the wrong technique you can actually wrap one section too tight and create a tourniquet like effect. If that happens you can actually wind up with more swelling in your foot than if you had no compression at all. I have seen injured runners, medical students, nurses, and even doctors wrap ankles incorrectly with an ace wrap. And the truth is it is easy to get it wrong. I often talk about compression socks and recommend them to runners to help reduce inflammation after an injury. In most cases I think compression socks are much more effective than many other forms of compression like elastic compression wraps simply because they are more reliable and can provide much more even consistent compression. But there are some cases where compression socks can do more damage and actually slow down the healing process. Some of it has to do with the specific injury. But some of it has to do with timing. Let me give you example. Let’s talk about second metatarsal stress fracture, which may be one of the most common over training injuries among runners. One time after I was lecturing on running injuries at a medical conference a doctor approached me in the exhibit hall. She asked me whether not I would always use compression for a metatarsal stress fracture. With that, she sort of rolled her eyes at me. And although I can understand why she felt like I was trying to be funny or somehow argumentative, it’s not really case. A stress fracture is a broad term. Stress fractures come in a whole range of trouble. In the very earliest phases, even though we call it a stress fracture, the bone isn’t actually broken. A more appropriate term is a “stress reaction.” In this case the bone is irritated and somewhat inflamed. There’s no actual crack in the cortex, or outer shell of the bone. Because the metatarsal bone isn’t actually cracked or truly broken, it’s very stable. It’s just sore. Basically is swollen. Granted the swelling is inside the bone, but it’s still just a problem of inflammation. It is a problem of swelling. If you have a stress reaction and this type of metatarsal stress fracture wearing compression socks makes a lot of sense. The compression will help push out that excess inflammatory fluid. Getting the fluid out will speed up the healing process. The bone is stable. You can put the socks on you can pull them off without any real risk of further injury. At the other end of the stress fracture spectrum is what we call a pathologic fracture. A pathologic fracture is one that is broken in two. A pathologic fracture is the one that most people visualize when we say someone has a broken bone. If you look at the x-ray of this type of metatarsal you can see an obvious fracture line where the bone has been broken into two distinct pieces. These types of metatarsal fractures are unstable. In fact I saw a runner at home one day when I was looking at his foot and I pushed on the head of the metatarsal, I could actually feel it move. He of course, winced in pain as he felt the grinding sensation of raw jagged pieces a broken bone moving in his foot. If you just touch it can move. And that hurts. Compression socks are very tight. It actually takes a lot of effort and special technique to get the socks on to your foot, over your heel, and up your ankle and leg. If you try to shove your foot into compression socks and you have an unstable metatarsal fracture like a pathologic fracture you’re most likely going to be moving the end of that broken bone. Moving a broken bone will never make it heal faster. If you have a stress fracture that you ignored and continued running on it until your foot was black and blue, bruised and swollen, and you actually developed a completely broken metatarsal bone, wearing compression socks makes no sense. Well, actually, let me rephrase that; wearing compression socks makes sense. But putting the socks on is more likely to cause injury. Unfortunately you just can’t get the socks on without jamming your foot into them and potentially injuring that unstable metatarsal bone. fracture. It’s where you ran a little too far, you stressed the metatarsal too much, and it developed a teeny tiny virtually invisible little crack in the bone. Although there is actually a crack in the bone, it takes a lot of force to actually bend the metatarsal bone enough to cause pain. So takes a whole lot of force to actually bend the bone enough to make that little crack bigger. If you have a true stress fracture wearing compression socks probably makes sense. The compression will help push out that excess inflammatory fluid. Getting the fluid out will speed up the healing process. If the bone is stable, you can put the socks and you can pull them off without any real risk of further injury. So the obvious question is how do you tell if the metatarsal bone is stable enough to put on compression socks without risk making it worse? My thought on this is pretty simple. If you can press on the metatarsal bone and it doesn’t cause any pain you can definitely apply compression socks without any significant risk of further injury. If you’ve barely press on the metatarsal bone and you have a lot of tenderness, then it just stands to reason that it’s going to hurt when you shove your foot into a tight compression sock and have to wiggle and writhe around to get the sock on over the foot. 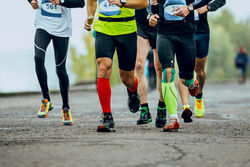 The first thing to think about is whether or not the stress fracture is a minor sort of early phase stress fracture or if it’s really a significant stress fracture that means you have a truly broken bone in your foot. The second consideration is timing. Even if I were to tell you shouldn’t wear compression socks because you have one of these unstable types of metatarsal fractures, it’s not going to be that way forever. After a couple of weeks of healing you start getting some stability in the bone because you start getting little strands of collagen healing all around that fractured area. It’s usually somewhere around two or three weeks that people stop having any discomfort when they push on the foot or move it around. Although it may not actually be safe for you don’t walk on it or go for a run at that point, you could probably put on compression socks. 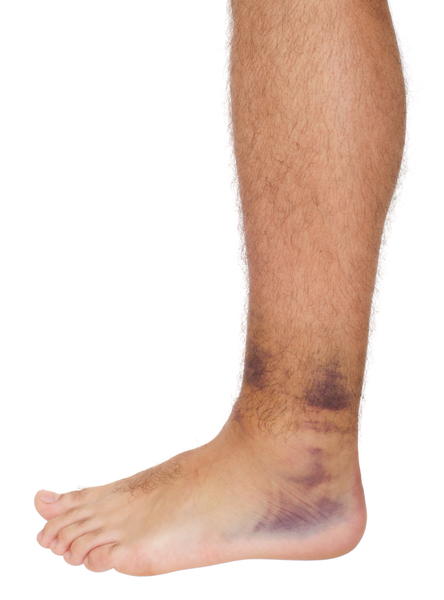 And even though you are not yet completely healed, if you look at your foot, you will notice that even two or three weeks after the injury you probably still have a lot of swelling. So once you are well into the proliferative phase of wound healing and a metatarsal fracture becomes stable it can be effective to use compression socks to help force that fluid out of your foot and keep your healing on the fast track. You also have to keep in mind that even after you’re back to running the remodeling phase of healing goes on for months. Some medical textbooks tell us that can go on for up to year and a half. You can still get swelling during the remodeling phase. So even after you get back to running I think it’s a great idea to use a compression socks to prevent the accumulation of inflammation they can freak you out and make you think the metatarsal stress fracture has returned. 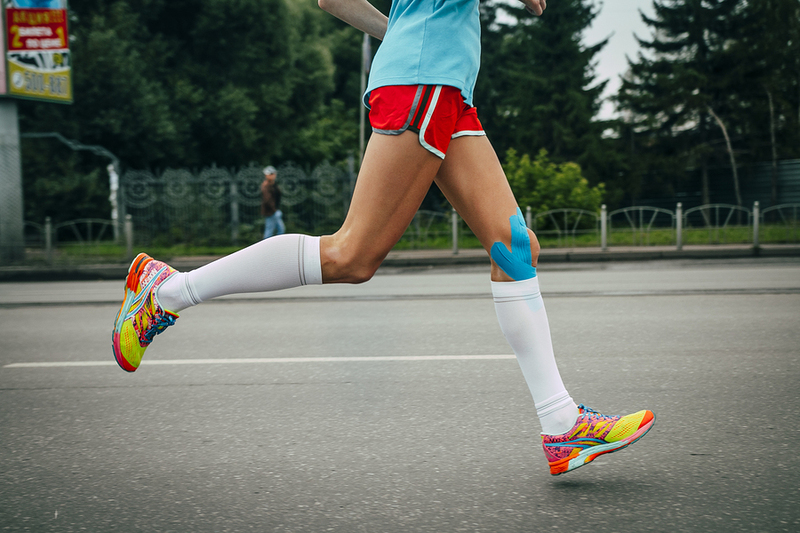 When it comes to other types running injuries you can basically apply the same principles to help you decide whether or not you should use compression socks. If you can get the socks on with lots of discomfort then you should probably just keep them on. But if barely moving your foot is really extremely painful then it seems unlikely you could put on the socks without the risk of more tissue damage. If it’s painful when you apply compression socks, and you get them on, then generally speaking, I think you should leave the socks on for several days before you remove them. Any benefit you might get from compression could be undone by all that motion, putting them on, taking them off, if you don’t give it several days to start healing. There are some running injuries that are more straightforward in terms of deciding whether not you should use compression socks. Applying compression socks seems to put more tension and stress on structures on the top of the foot that doesn’t structures on the bottom of the foot. The plantar fascia is the largest ligament on the bottom of the foot and possibly the structure in the foot most commonly injured. By some accounts plantar fasciitis accounts for nearly 40% of all visits to podiatrists in United States. In the book I wrote on runner’s heel pain you may have learned about the other conditions like bursitis, calcaneal stress fracture and a partial rupture of the plantar fascia, which can all cause similar symptoms to plantar fasciitis. And although these conditions all involve different structures, they are all on the bottom of the foot. So in general, if you have pain on the bottom of the foot and you’re worried that you have plantar fasciitis or a stress fracture in the heel bone or bursitis underneath the heel, compression socks are great idea. Even if you have a partial rupture of the plantar fascia, there is very little risk of further tissue damage with any of these conditions when using compression socks. If you have swelling at the base of the second toe and you think you have a plantar plate sprain, compression socks can really help to reduce that inflammation. If you have peroneal tendinitis or posterior tibial tendinitis, compression socks can be hugely helpful in reducing the inflammation. You just have to make sure you don’t have a lot of tenderness when you’re applying the socks. Again if it’s really tender when you’re applying the socks then you may be causing damage just with all that motion. In that case, if you’ve already put the socks on, you should leave them on for several days before you remove them. 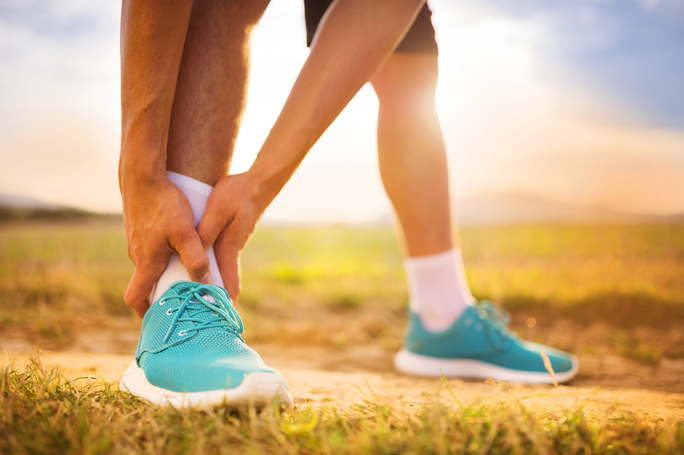 Ankle sprains are another common injury affecting runners. An ankle can really swell up. But the same sort of rule applies here. If you have a lot of tenderness when you’re putting on the sock you should leave them on for several days. Don’t take them off and on, over and over, because you just might do more damage to the injured ligaments. If you have a lot of tenderness, it may be safer to simply wrap the foot and ankle with an ace wrap as your initial form of compression. Then, once it is healed for a few days, you may be able to get the socks on without so much risk. And that brings up another point. One way to tell at the outset how much tissue damage you have is based on the amount of bruising you see. Anytime you have a bruise it implies that you did some sort of significant tissue damage. Either you cracked a bone, tore ligament, ripped a joint capsule or split at tendon. But whatever you did, you had a significant enough injury to cause bleeding under the skin, which you see on the surface as a bruise. So if you have a running injury and you see a bruise on your foot or ankle, then you may want to think twice about wiggling that injured foot into a compression sock. So, should you wear compression socks if I have a running injury? Well as I said, it depends. But now you understand the basic thinking behind my decision making process when I look at a runner in person or through a Webcam during a Virtual Doctor Visit. Just use a little common sense and when in doubt get help from an expert who really understands running injuries. Do whatever it takes to get back to running as quickly as possible.